Negril Jamaica, Moodi Bleus @ the West End Road. This beautiful, quiet villa sits on the Cliffside shore of an old coral bed. 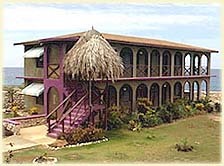 It is the ideal rental property for the tired and weary who desire total relaxation in a tropical paradise. Imagine yourself laying back in a refreshing salt water pool and listening to the sound and rhythm of the surging surf. If it is seclusion AND convenience you crave , the property is totally enclosed by a seven foot high natural stone wall to ensure your complete privacy, but is only minutes from the Town of Negril. Moodi Bleu's Villa features two furnished bedrooms, one downstairs and one upstairs accommodating a total of 6 persons. Each room has a delightful view of the Caribbean Sea. You will experience breath taking scenery with peace and privacy in a tropical paradise, when you rent this villa with your family or friends. Spending time with a loved one, a few friends or even family is no problem. Each of the bedrooms rooms comes with a double and single bed, air-conditioning, ceiling fan and it's own private bath and entrance. The Master room connects directly to its own private kitchen and dining area, just within reach of a cool pina colada or a refreshing fruit punch. All rooms face the ocean ................Giving you a spectacular view of the calm Caribbean sea or our famous Negril sunset. Prepare your own meals at leisure, or for those wishing for complete relaxation, have sumptuous Jamaican dishes or International cuisine prepared by our talented and reliable cooking staff. After dinner, relax in the beautiful living area ( All furniture pieces are Jamaican hand crafted items) with the company of good friends, a Planter's Punch or Red Stripe Beer. To keep you entertained, watch the latest on cable T.V. or pick a movie from a selection of hundreds of high quality video cassettes. Musical CD's are also available for those who prefer audio entertainment. This Villa was built close to the sea and away from the main road to experience the tranquility nature has to offer. In keeping with that theme, relax in the Moodi Bleu's unique salt water pool... It has a view that can only be described as 'Spectacular'. An enclosed private beach awaits your presence... Here you can sun bathe as you like... ...in total complete privacy.